Perhaps no one has fleshed out the complex interaction between religion and law better, and is more qualified to do so, than Winnifred Sullivan. As former vice president of the North American Association for the Study of Religion and current professor of religious studies and law at the University of Indiana-Bloomington, Sullivan brings a wealth of expertise and methodological range to the topic. 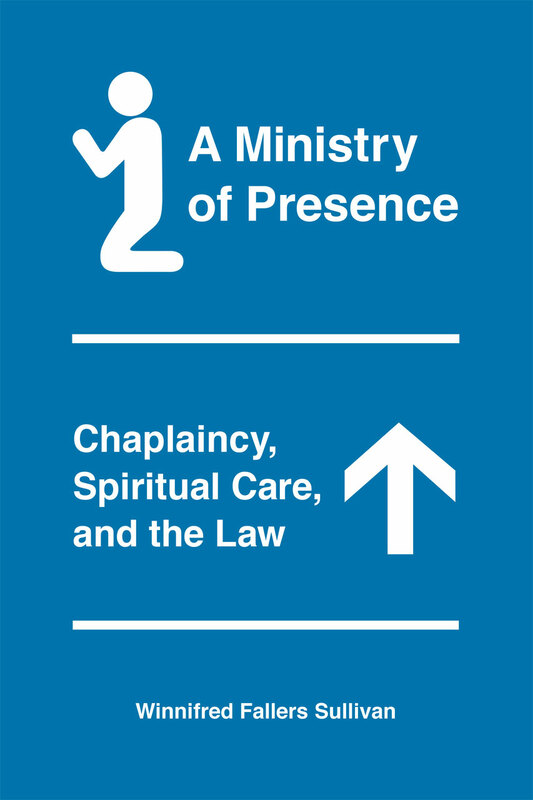 In her latest work, A Ministry of Presence, Sullivan analyzes the complicated place of chaplains who work outside of religious institutions and whose ‘presence’ in VA hospitals, police departments, and the military presents legal quandaries about the public role of individuals who serve an explicitly religious purpose. Sullivan situates her study of chaplaincy in a broader examination of the ways in which legal thinking on religion has evolved and continues to shape religious practice in the public domain. Sullivan is particularly interested in the “ways in which the prevalence of the secular rule of law itself acts a disciplining force on religious life.” (15) The change in the role of the chaplain, according to Sullivan, provides a window into just how much legal thinking on religion has changed over the last fifty years. Whereas chaplains once were justified as a way to accommodate religious pluralism (i.e. to accommodate diverse religious particularities), recent court cases have focused on the function of chaplains in facilitating a spirituality that is increasingly defined as a natural and universal component of human existence. This shift means that chaplains no longer serve primarily on behalf and within their own confessional traditions but rather assume responsibility for fostering a spiritual health now considered integral to the very operation of government. The Ministry of Presence is an important contribution to ongoing scholarly discussions in religious studies, American history, politics, and legal studies. The reader is indebted to the depth and nuance of Sullivan’s legal knowledge as well as her willingness to engage recent historiographical and theoretical trends in the study of religion in the United States. In contrast to John Lardas Modern’s recent work on spirituality as a site of negotiation between religion and the rationalism of modern science, Sullivan shifts our attention to how the language of spirituality in the legal setting has conditioned religious life in the United States at least as much as “genealogy of spiritual experimentation in the US.” (32) The language of spirituality, according to Sullivan, has not only made a place for chaplains but has enabled and produced a variety of spiritual practices that the courts have increasingly defined as a natural aspect of human life. Sullivan’s most recent work provides a compelling window into the world of the chaplain and the laws that shape it. But more importantly, Sullivan has contributed much to our understanding of the many ways religion continues to influence ‘secular’ legal trajectories, and vice versa. Kolby Knight is a second year Ph.D. student in the Department of Religious Studies at the University of California, Santa Barbara. He studies nineteenth-century American religious history, with particular interest in how ideas about Catholicism and Catholics themselves have influenced religious and legal discourses in the United States. This entry was posted in Politics and Religion, Religion and Society, Religion and Theory, Theory and Method, Theory in the Real World, Uncategorized and tagged A Ministry of Presence, Freedom From Religion Foundation, John Lardas Modern, Kolby Knight, Michel Foucault, North American Association for the Study of Religion, University of Indiana-Bloomington, Winnifred Sullivan. Bookmark the permalink.